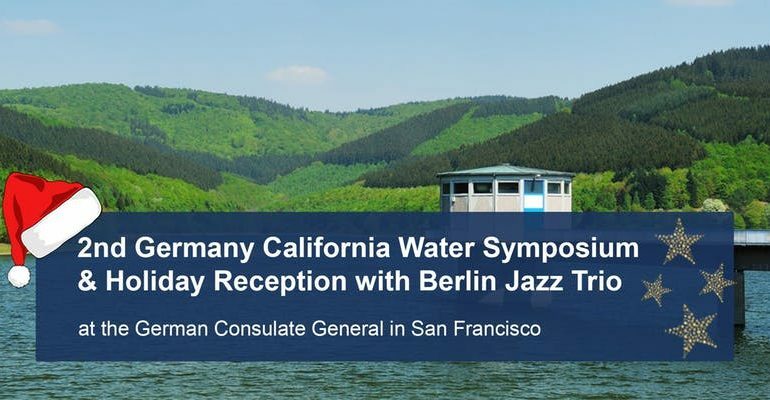 With a focus on transatlantic approaches, U.S. and German water experts will provide you with valuable insights on the current state of the water industry in California and opportunities on how to overcome any existing challenges. In two different panel sessions, you will also learn more about the innovative approaches of 11 German companies. The event is part of a German water technology trade mission supported by the German Federal Ministry for Economic Affairs and Energy taking place from December 10-14. The German companies participating in this trade mission will meet with private businesses, research institutions, and government representatives to exchange ideas, discuss new developments and lay the groundwork for future cooperation. After the panel discussion, we invite our members and friends to a Holiday networking reception with our special music guests: Berlin Jazz Trio, who will play benefit shows in San Francisco for the fire victims of Butte County. For more information on their benefit show at SF Jazz click here. Dr. Kueke GmbH is a supplier of water treatment technology using chlorine dioxide, with applications ranging from drinking water to cooling systems to swimming pools to breweries. Their procurement manager, Boris Hinz, is looking forward to exchanging thoughts with decision-makers in California with the final goal of opening up avenues for applications on the west coast. Eco Innovation Group is a German production and development company exemplifying visionary engineering and many years of experience in water treatment despite their young age. Bringing extensive experience in water treatment and irrigation in Africa, their Managing Director, Asaad Farag, is looking for potential partner firms for knowledge exchange and collaboration with the ultimate goal of opening a production facility in California. More than 40,000 installations of HUBER plants worldwide contribute to a sustainable use of water, energy and resources. They provide solutions for sewage sludge treatment and drying, membraneplants for water reclamation as well as a substantial range of support services. Their board member Rainer Köhler is looking forward to establish contact with potential partners and gain an understanding of their planned projects. KS is a german SME providing an innovative solution for water-drainage for bridges. Their CEO, Hubert Steinbauer, is looking forward to guided tours of bridges to gain an overview of the structures and the current state of water-drainage. KSB is a manufacturer of water and wastewater pumps and in this function the 4th largest manufacturer worldwide. They offer holistic solutions spanning the entire water treatment supply chain, from water extraction to water and wastewater pumps and water transport. Their Sales Director, Stefan Borst, is looking for potential partners for knowledge exchange and future collaborations as well. Neuguss is an innovative service provider for pond water treatment and water homogenisation using Oloids. Oloids enable up to 50% of energy savings through energy-efficients oxygen diversion in the water. Putzmeister is a manufacturer of custom-made industry pumps for usage in water treatment plants and drinking water pipelines. They employ a holistic approach, supplying a complete water transportation infrastructure. They are European market leaders and have a subsidiary operating on the East Coast, and their Product Manager Tobias Lutz is looking for potential business partners and knowledge exchange. Raedlinger Primusline offers an innovative solution for trenchless pipeline sanitation. With a flexible, kevlar-strengthened high-pressure hose, their solution can support pressures of up to 82 bar / 1180 psi. They have already completed more than 50 projects in Northern America and their VP of Development, Andreas Fleischmann, is looking for partners for knowledge exchange and potential future collaboration. Roeders is a classic German family-owned company manufacturing an innovative felt which can be used for water filtration and pressure hoses. The attributes of felt (higher permeability at equal filter performance) make it a more cost-effective solution than traditional filters. Their Key Account Manager Andreas Kiesel is looking forward to meeting future potential partners to gain an overview of the California market and raise awareness of their innovative technology. VEGA is a multinational company operating in more than 80 countries (including the United States East Coast) and employing more than 1400 employees. Their new instrument measures water level, density and pressure reliably at a low-cost. They are motivated to learn more about the Californian water and wastewater market and get an overview of how their new technology could be applied on the West Coast as well. Weber Entec is an innovative market leader for disintegration of biomass using ultrasonics. Their CEO, Christian Eichhorst, is looking forward to a fruitful exchange of knowledge and establishing first contacts for a planned market entry to California in about 2-3 years.